Louvain-la-Neuve is a planned city in the municipality of Ottignies-Louvain-la-Neuve, Belgium, situated 30 km southeast of Brussels, in the French-speaking part of the country. The city was built to house the Université Catholique de Louvain; following the linguistic quarrels that took place in Belgium during the 1960s, and Flemish claims of discrimination at the Catholic University of Leuven, the institution was split into the Dutch language Katholieke Universiteit Leuven which remained in Leuven, and the Université Catholique de Louvain 1). 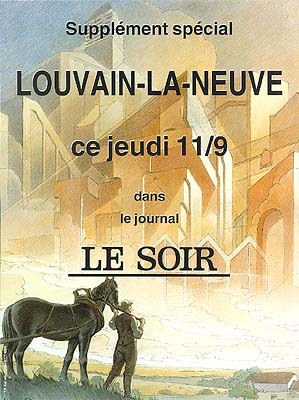 François Schuiten has done several projects in Louvain-la-Neuve. He was interviewed in the UCL magazine.